Lou Piniella will step down as Chicago Cubs manager after Sunday's game, August 22, 2010. In honor of his almost 50-year playing and managing career for numerous franchises (including my Seattle Mariners), I wanted to look back at his earliest cards, before Lou became "Sweet." 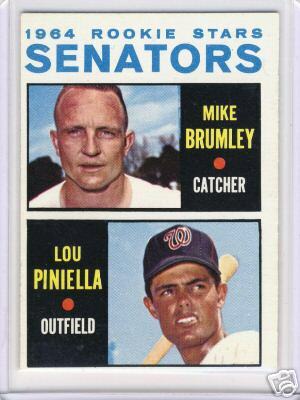 Topps debuted Piniella as a 20 year-old Washington Senator Rookie Star with Mike Brumley, after they selected Lou in their 1st year draft. (They made a "city swap" with Minnesota that year, so Washington was technically the expansion team.) He appeared in 4 games, had 1 at-bat, and returned to the minors for 4 years. This second Rookie Stars card was a homecoming of sorts, as Cleveland originally signed 18 year-old Lou in 1962. 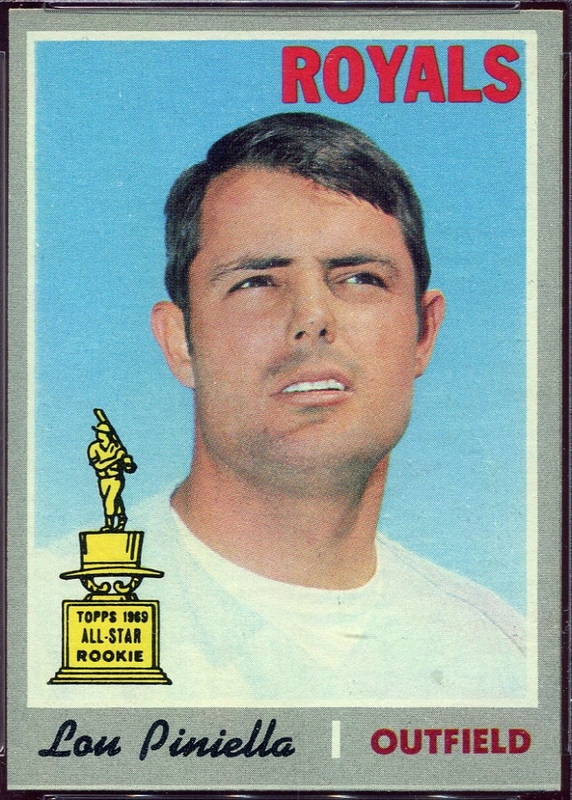 They reacquired him in a 1966 trade and he played in a half-dozen 1968 games. The Pilots drafted Lou away from the Indians in late 1968, but shipped him to Kansas City on April 1, 1969, becoming the first of Seattle's many regrettable trades. Here's a clip of what SportsEcyclopedia.com had to say. 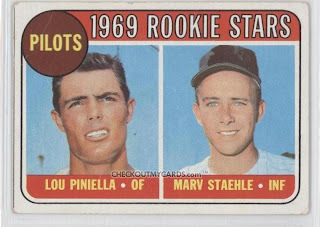 "Spring Training 1969: In a sign that the Pilots were doomed for failure Lou Piniella a 26-year-old rookie is traded at the end of spring training. Piniella was sent down a few weeks earlier despite having strong numbers in spring games. The problem was that Pilots manager Joe Schultz did not like Piniella, who was set to make $175, 000. The Pilots did not want to pay him so they got rid of him. Piniella would end up with the American League's other 1969 expansion team the Kansas City Royals, and he would win that year's Rookie of the Year." It's unusual for players to appear on three different Topps multi-player cards, but not unique. 1960s prospect Bill Davis shared space on a card FIVE TIMES, one per year from 1965 to 1969. Check out more details (and scans) at "Hope Springs Eternal" from the blog 1207 Consecutive Games. Compare Lou's hairstyle to the 1970 Topps Super set below. These photos came at least a year apart and probably more; "Super" Lou looks a lot younger and much more tan. A spring training shot from Florida, perhaps? Not many gents accomplished what Lou did, as player and (especially) manager. Here's hoping he can relax equally well and hey--happy 67th birthday next weekend! Thanks! I had to give Lou his due and those multi-card Rookie Stars seemed like just the way to do it. As both player and manager, he suited up for a lot of different franchises!